Home → * News and Stories → Longyearbyen: The most expensive port in the world? Longyearbyen: The most expensive port in the world? 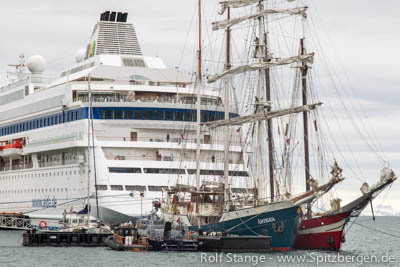 From 2019, large cruise ships will have to pay twice as high harbour fees in the port of Longyearbyen than they did this year. A few days ago, Longyearbyen’s harbour master Kjetil Bråten announced that the price increase is a tool to regulate mass tourism and at the same time to generate higher income. He would even like Longyearbyen to become “the most expensive port in the world” due to its remote location and the extraordinary operating costs. Ship tourism to Spitsbergen is on the rise: in 2016, 75,000 cruise passengers went ashore in Longyearbyen, compared to 15,000 in 2010. The harbour fee Longyearbyen will in the future be based on the size of the ship. Ships with more than 100,000 gross registered tons will have to pay twice as much, namely 1.68 NOK (about 0.17 Euro) instead of 0.84 NOK per ton. In addition, the port will charge a fee of NOK 25 (approx. 2.60 Euro) per passenger instead of NOK 23. This will affect, for example, the cruise liner MSC Preziosa, which, according to its own homepage, delights its 3,500 passengers with staircases decorated with “Swarovski diamonds”. MSC Preziosa has announced its arrival in Longyearbyen in 2019 and will then have to pay a total of 940.000 NOK (around 96,000 euros) more than in 2018. Smaller boats will also be affected by the higher fees. But since the fee depends on the size of the boats the price increase is highest for the large cruise ships. In addition, preference will be given to ships whose passengers support the local economy on their shore leaves. However, harbour master Kjetil Bråten believes that the large luxury ships will not necessarily be deterred by the higher fees. This is not the primary goal. According to Bråten, it is rather a question of finding a balance between regulating mass tourism and generating the income needed to develop the port infrastructure and promote the local economy. Who knows, perhaps MSC Preziosa will have to scratch a few diamonds from the railing to pay the port dues in Longyearbyen? Interesting side note: According to a survey amongst 739 readers conducted by the local newspaper Svalbardposten, 60 percent agree with the statement that Longyearbyen should no longer accept cruise ships at all.